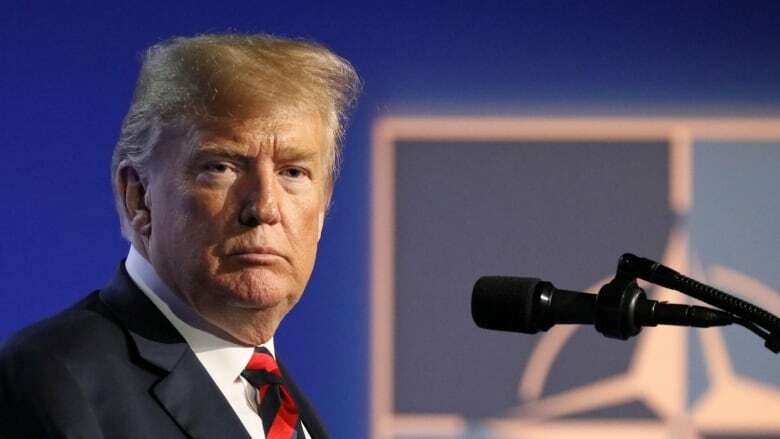 U.S. President Donald Trump's representative to NATO is leaving some daylight between herself and her boss on the thorny political matter of Canada's monetary contributions to the alliance. "Canada is doing so many things that are very important," Kay Bailey Hutchison said in an interview airing Tuesday on CBC News Network's Power & Politics. Trump has berated NATO members repeatedly for failing to spend enough on defence. In 2014, NATO countries committed to spending two per cent of their gross domestic products on defence by 2024. 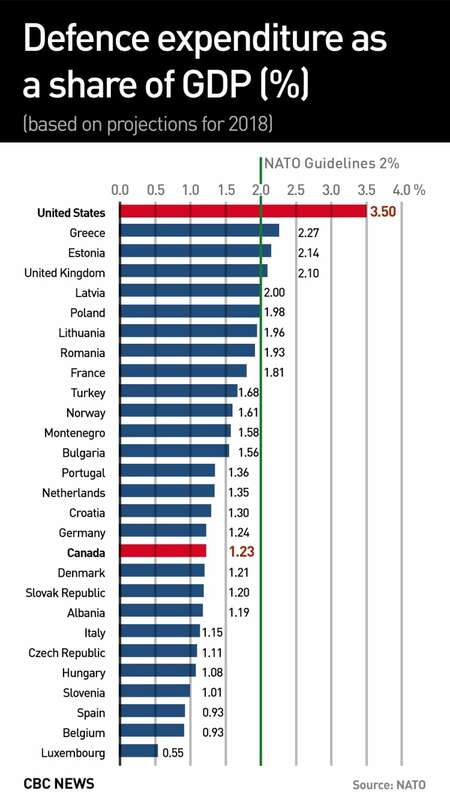 Canada's defence spending was estimated at 1.36 per cent of GDP in 2017 and is only expected to rise to 1.4 per cent by 2024. Hutchison acknowledged that "we need the two per cent" — but suggested there are "many" other ways to contribute to the alliance. Trump says NATO allies like Canada are 'delinquent' on military spending. Is he wrong? "The contribution of forces, of troops, of helping in the common funding of the alliance's missions such as Iraq, Afghanistan, and the enhanced Forward Presence [in the Baltic states], all of which our allies are doing." Hutchison, who was formerly a Republican senator from Texas, specifically cited two ways in which Canada is supporting NATO. "They are the leader in Latvia and it's a very important mission for NATO, to show that this alliance is going to stand firm against Russian malign influence," she said. "In addition, Canada has recently stepped up for our most important new mission, which is to help stabilize the Iraqi military and their police through advising and training in Iraq. Canada is the lead and commander of that new mission. "I think our allies know that one thing is not more important than the other parts of (the) contribution." Hutchison's comments stand in stark contrast to Trump's own take on NATO cost-sharing. The president spent most of his time at the NATO leaders' summit in July calling out what he called "delinquent" nations, accusing Europe of freeloading off the U.S., calling into question his country's commitment to Article 5 — the "collective defence" clause that treats an attack upon one NATO nation as an attack upon all of them — and threatening to withdraw from the alliance entirely. Her view seems more in line with that of Prime Minister Justin Trudeau, who has said the two per cent benchmark doesn't adequately address a country's total commitment to NATO. "We'll always step up, with cash yes but also with commitments and capacity. 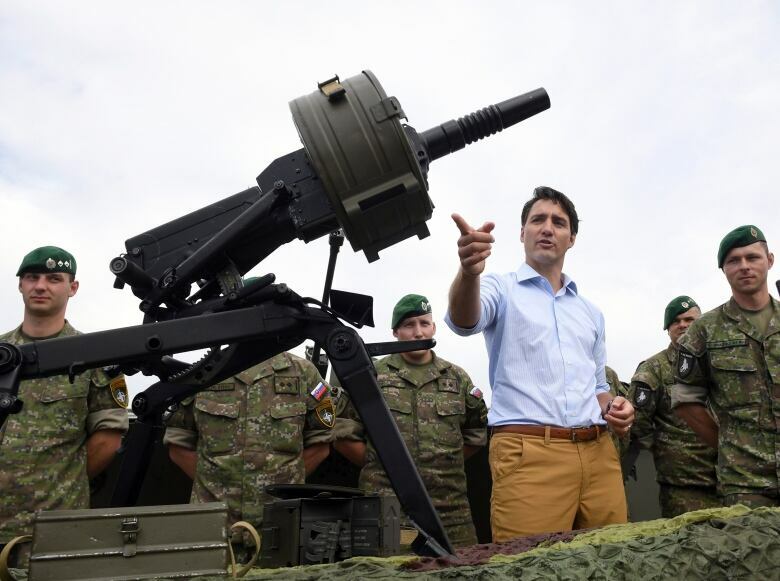 That's what NATO is looking for," Trudeau said in July from the Brussels NATO summit, adding that there are no plans for Canada to double its defence budget. And despite Trump's repeated threats to pull out of NATO, Hutchison tried to offer reassurance. "America is committed to this alliance," she said. "I think our allies know that America is here, we are committed, we are the leader of this alliance and we will continue to be." Hutchison set off shockwaves of her own on Tuesday at a press conference at NATO headquarters in Brussels — when she suggested the U.S. might "take out" Russian missiles for violating an arms control treaty. Russia denies it has violated the treaty. After the Russian foreign ministry blasted her comments as aggressive and destructive, Hutchison said on Twitter that she "was not talking about preemptively striking Russia." Asked Tuesday what the U.S. might do about Russian missiles that appear to violate the Intermediate-Range Nuclear Forces Treaty — originally signed in 1987 between the U.S. and the Soviet Union — Hutchison said that "the countermeasures would be to take out the missiles that are in development by Russia in violation of the treaty." Russia's Foreign Ministry said that Russian military experts are working on a more technical response to Hutchison's comments. NATO defence ministers will address the alleged Russian violations at a meeting in Brussels later this week. In her interview with CBC News, Hutchison also weighed in on Sunday's referendum in Macedonia, which would have paved the way for the country to join NATO after Macedonia and Greece came to an agreement on a name change. The vote to change Macedonia's name to North Macedonia won overwhelming support in a referendum — but because of the low voter turnout, the results are not binding. NATO, the European Union, the UN secretary-general and the United States have all voiced a desire to see the small Balkan country join international institutions, despite Russia's hostility to the idea of nations in the region joining the alliance. Canada is among those enthusiastic about Macedonia's NATO prospects, despite the referendum results. "We believe the Euro-Atlantic path will help ensure a secure, prosperous and democratic future for [Macedonia]," said Stéphane Dion, Canada's special envoy to the EU and ambassador to Germany, in a joint statement with Kati Csaba, Canada's ambassador to Macedonia. Hutchison said she remains optimistic that Macedonia will be "our 30th member in the near future." "I think the vote was a great success," she said. "They will make their decisions whether they want to join NATO. We have committed to accept them if they do come forward. I think they will." Final results from Sunday's referendum showed that among the 36.9 per cent of registered voters who cast ballots, 91.4 per cent supported the deal that would change their country's name to North Macedonia. At the NATO summit, Trudeau won the argument. Did it matter?